During our recent trip to Estes Park, Colorado we had the opportunity to stay at a few places. Each accommodation had something unique that would make it great for families. If you’re planning a trip, here are four picks for where to stay in Estes Park, CO. Thank you to Visit Estes Park for providing accommodations for us during our visit. BEST FEATURE: Location – it’s located just at the end of the main street for Estes Park. Great place to stay if you like being close to town. As I drove into The Maxwell Inn I was immediately charmed by it’s quaint, woodsy design. The property is a family-owned establishment, and you can tell the family enjoys creating a warm and inviting atmosphere for their guests. It was great calling The Maxwell Inn our homebase as we explored the town of Estes Park. Our room was located in a new building they just recently added that houses four rooms. Inside were two queen size beds, a bathroom with shower, and a sitting area with a fireplace. Since it was a new building all the furnishings were fresh and clean. I loved the rustic style decor and spending downtime in the room was very relaxing and enjoyable. The Maxwell Inn features a nice continental breakfast with pastries, cereals, and oatmeal. They also have a lovely back patio off the lobby that is a perfect spot for enjoying breakfast in the morning. At night the patio also has a firepit for enjoying the outdoors in the lovely Colorado evenings. BEST FEATURE: Space – staying in private cabins allows families extra space and room. Glacier Lodge is also outside of town and nestled in some woods next to a river, great for outdoor space. If you’re looking for a cabin retreat for your trip to Estes Park, Glacier Lodge would be a great spot to stay. The property has various room types, from individual cottages & cabins, duplexes, and larger, home-style group facilities. The buildings feature riverside, poolside, property, or mountain views. Glacier Lodge also is located close to the Beaver Meadows entrance to Rocky Mountain National Park, and just down the road from the YMCA. We stayed in the Vista cabin and I loved it’s location right along the riverbank. It featured a small back porch where we could sit and watch as the river rushed by. Inside the cabin was a kitchen, living room with a daybed couch, bedroom with queen bed, and a bathroom. Having the kitchen is great for making your own meals and saving some money on vacation. I will note that the furnishings were a bit worn, but our stay was still very comfortable and enjoyable. The property also has some great amenities. Mia absolutely loved the pool that was on site. And my friend’s son who stayed with us loved playing basketball with another visiting guest. My favorite part of the stay was the Thursday Mountain Breakfast. It was served outdoors at their campfire corral and had the most delicious pancakes I’ve ever tasted. No joke! They also served cowboy coffee in addition to eggs and bacon. Definitely plan for a Wednesday night stay so you can enjoy the complimentary breakfast! BEST FEATURE: Family amenities – this motel is located alongside Lake Estes, making it great for families. It also features a nice pool, free DVD movie rentals, fresh popcorn, and a complimentary breakfast. Located on the opposite end of Estes Park as The Maxwell Inn, Murphy’s Resort is next to Lake Estes. This is a standard motel style property, but does feature some fun amenities for families. I was impressed with how clean our room was, plus how spacious it was. The pool sits in the center area of the property, and was a big hit with the kids. You can also check out a DVD from their massive library if you’d like to do a movie night in your room. And hey, they even have fresh popcorn in the lobby. For visitors who are planning to enjoy Lake Estes, Murphy’s Resort is in a prime spot. Great for swimming or fishing at the lake. Or you can rent bikes at Estes Park Mountain Shop down the road and cruise around the four mile bike path around the lake. BEST FEATURE: Activities – The YMCA of the Rockies has a lot of activities available for guests and visitors. Mini golf, climbing wall, pool, hiking, and archery are just some of the activities. While we didn’t stay at the YMCA, it deserves to be on this list of where to stay in Estes Park. Lizzy attended camp at the Y, so she stayed onsite in one of the lodge rooms. 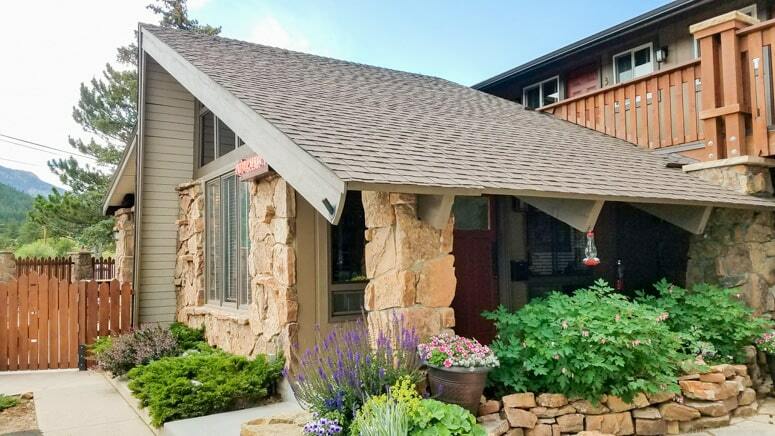 People who are visiting Estes Park can stay in one of the hotel style lodges, or rent one of the cabins or vacation homes located at the YMCA. You do not have to be a member to be able to stay at the YMCA of the Rockies. The big draw for staying at the Y is all the amazing activities you can do on site. We really enjoyed our time playing mini golf and climbing the rock wall. There are also some great guided hikes and fly fishing opportunities for guests. It’s a sprawling property with tons to do. It’s also near the Beaver Meadows entrance to Rocky Mountain National Park. Our stay in Estes Park was amazing and I can’t wait to return in two years when my girls will both attend youth camp. Now you have four ideas for where to stay in Estes Park, stay tuned for my post about what things to do in Estes Park. Plus, check out my post about the 7 Outdoor Adventures Every Kid Should Do in Estes Park in the Summer, and these National Park tips for beginners. If you’re heading to Colorado for the winter, check out this post about things to do in Colorado Springs in the winter.